Visualworker.net Blog: PostFinance app, easy, safe and fast! Today I’m going to talk about another new fresh incredible app, this time, it’s made in Switzerland. PostFinance, the bank from the Swiss post service, created a new app, as 3.6 million people in Switzerland own a smartphone, which means, almost half of country. This means: Swiss people need Swiss apps. 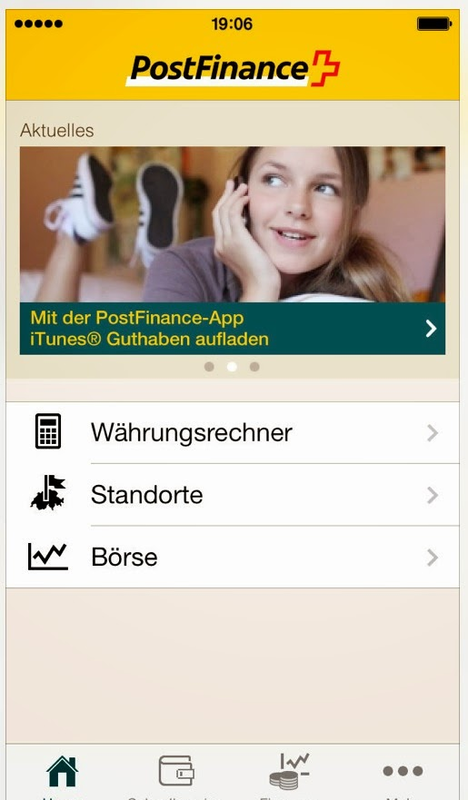 So PostFinance did a nice app for their bank service like all big banks? No! PostFinance did a huge research, to know what are the most frequent uses for a smartphone in Switzerland, and the result is: The PostFinance app! PostFinance app makes it easy and more convenient to buy goods via smartphone. Besides managing customers’ banking needs, the app allows users to buy credit for iTunes, the Paysafecard, and gaming consoles such as xBox, Nintendo, and Playstation. More than half a million people have downloaded and installed their app. For users, the benefits are that they don’t need to provide a credit card and the app is also very safe. The app is available for both Iphone/Ipad and Android devices. Once installed, users buy credit through the app – which comes from their PostFinance bank account – and receive a code. When they want to buy digital goods, it can be an e-book for example, they simply enter that code at the online checkout and download the book. As you only give a code when you buy something, you’re much safer then using you’re credit card number, as other gateway payments services works. But, the big deal with PostFinance is that you’re not connected to third-party services. The transaction is made directly by the bank, which makes you’re life easier, faster and safer.